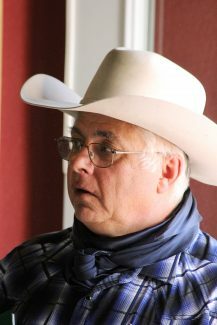 Rich Price, Opal, S.D., Millar Angus bull buyer. Dean Andrews, Red Owl, S.D. purchased a couple Millar Angus bulls. Bruce and Chris Gotfredson, Newell, S.D. and Brad Bauer, Union Center, S.D. 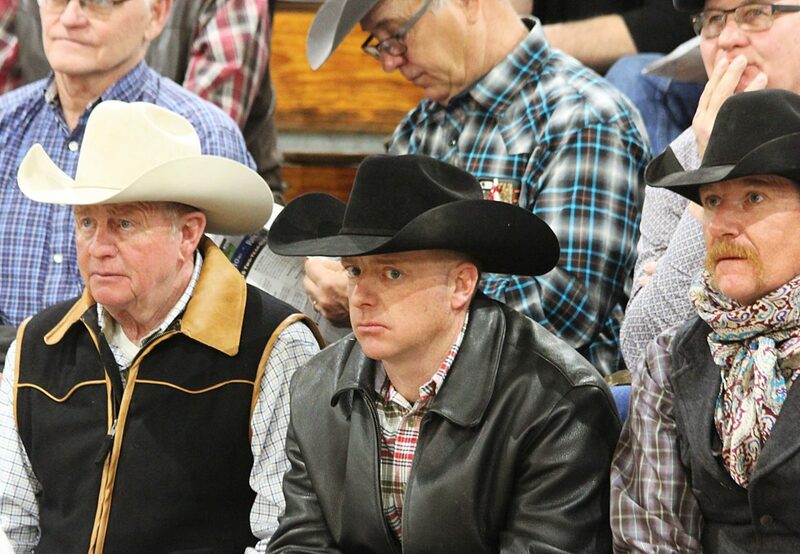 purchased bulls at the Millar Angus sale. 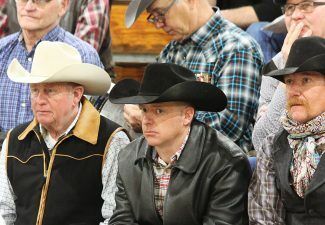 Jon and Breezy Millar along with their young family Ryle and Kobi held their 16th annual bull sale at the Millar Ranch sale facility east of Sturgis on Feb. 15. 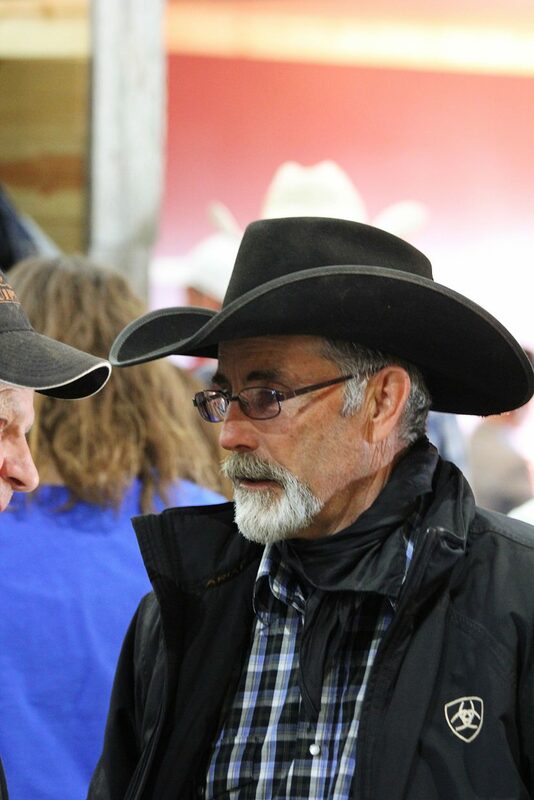 The Millars do everything right in the presentation and feeding of the bulls and taking care of their customers. The sale facility is top notch, excellent ribeye steak sandwich for lunch, great hospitality and above all, cattle that are bred right and fed right. Topping the sale was lot 4, Millars Tombstone 698, a Feb. 2016 son of Tombstone 050. This bull had a weaning ratio of 115, yearling ratio of 114 and epds of BW 1.3 WW 74 YW 114 Milk 31 and sold to Darren Fischer, Midland, SD for $11,000. Brad Bauer, Union Center, SD got lots 5 and 24 at $11,000 each. Lot 5, Millars Tombstone 6109, a Jan. 2016 son of Tombstone 050 has epds of BW 2.2 WW 67 YW 105 Milk 30. Lot 24, Millars Capitalist 670 is a Feb. 2016 son of Pyramid Capitalist with epds of BW .9 WW 59 YW 97 Milk 29. Lot 2, Millars Bam 641, a Jan. 2016 son of Tombstone 050 with epds of BW 2.5 WW 70 YW 114 Milk 31 sold to Neil Birkland, Dupree, SD for $10,500. Ross Cuny, Buffalo Gap, SD purchased lot 23, Millars Capitalist 683, a Feb. 2016 son of Pyramid Capitalist with epds of BW -.6 WW 68 YW 92 Milk 20 for $10,500. Rounding out the $10,500 bulls was lot 75, Millars Aviator 689, a Jan. 2016 son of Musgrave Aviator with epds of BW -1.2 WW 60 YW 104 Milk 23 selling to T Bone Angus, Brunswick, NE.